The Houston Astros may have the second-best record in baseball, but they just shook up their bullpen in a major way. 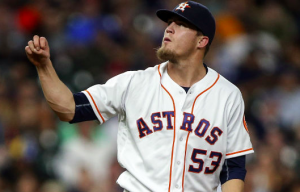 On Wednesday, the Astros demoted long-time closer Ken Giles to triple-A. The move comes one day after Giles allowed hits against all three batters he faced in a non-save situation before he was pulled by manager A.J. Hinch. After his poor performance, Giles appeared to have harsh words for Hinch when the manager came to the mound to take him out. Giles did not speak to the media after the game while Hinch denied hearing anything from the disgruntled reliever. The fact that Giles has now been demoted to the minors would appear to confirm that Hinch heard Giles and that the pitcher was speaking directly at the manager. The timing is too coincidental to ignore. Of course, the Astros brass did their best to diffuse the situation on Wednesday. Giles’ performance this season hasn’t exactly been that of a closer on an elite team. He’s 12 for 12 in save situations. However, Giles has also posted a 4.99 ERA in 34 appearances. The Astros, at least publicly, are focused on getting Giles back on track. For the time being, Hector Rondon would appear to be the top candidate to serve as Houston’s closer. He’s seven for 10 in save opportunities this season while posting a 1.69 ERA. Chris Devenski and Brad Peacock also have two saves each this year. Collin McHugh and Tony Sipp are also having excellent seasons coming out of the Houston bullpen. Behind that contingent, the Astros currently have the second-lowest bullpen ERA in the American League. The Houston bullpen should be in good shape without Giles. However, this could put them in the market for an extra reliever with the trade deadline approaching. The Astros won the World Series last year very much in spite of their bullpen. They may be more comfortable heading to the postseason this year with a deep contingent of relievers and no question about who the closer is. Meanwhile, Giles’ future with the team would appear to be up in the air. His demotion to the minors appears to be punitive for what he said. The team also gave no indication for how long he’ll be there. The Astros could end up shopping him at the trade deadline in hopes of making him someone else’s problem. Needless to say, Giles’ antics on Tuesday have created an unnecessary set of problems for one of the best teams in baseball.